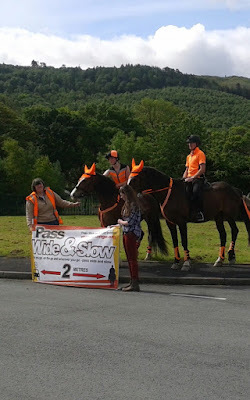 Many of you will have heard of the campaign GLOW MEANS SLOW currently running to help with educating motorists about the safe way to pass a horse while out on the roads.It also has a little added extra & helps riders to understand why it is sort important to be seen, both on & off the road. We asked Sarah Johnson from the campaign to tell us a little bit more about it! 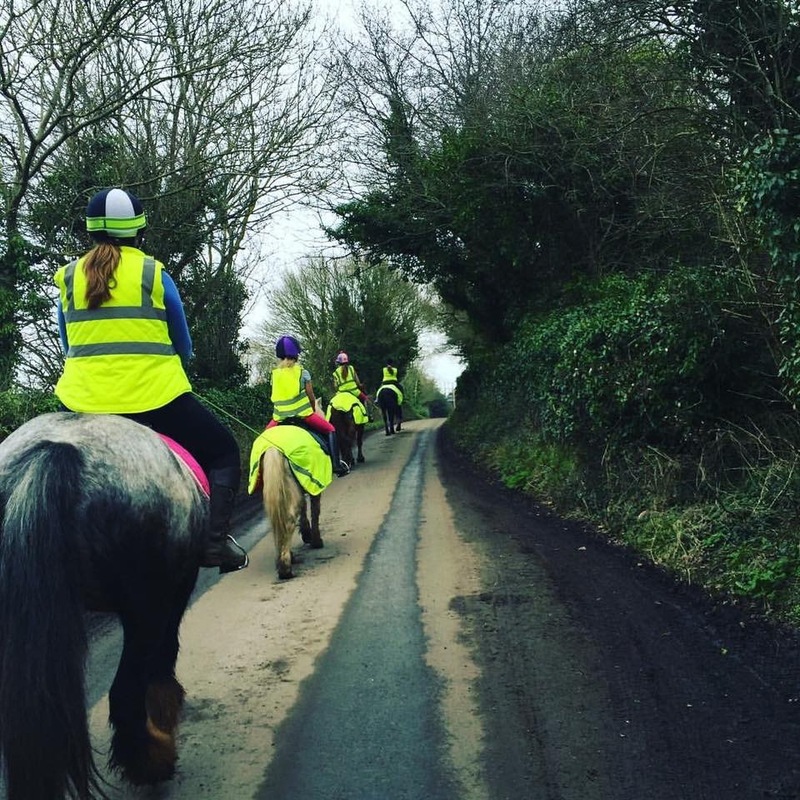 Glow Means Slow was created in February 2017 to help raise awareness of the importance of wearing HiViz when riding out on the roads and rural lanes. 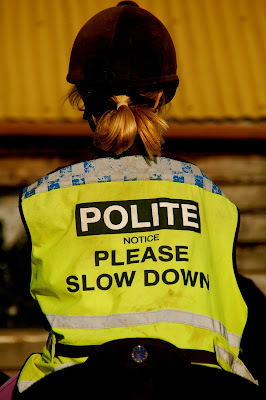 As a car driver & a horse owner, I've come across many other riders on the roads that don't wear HiViz and to be honest they wonder why we end up with altercations with motorists.....HiViz makes you stand out! In certain lights you have 4 colours available…. yellow, orange, pink & green. But also recently, after researching into HiViz ridden wear, I've also seen that some HiViz wear is available in multi-colour, and depending on the scenery around you, depends on which stands out the most. The British Horse Society released a comparison photo about being seen when riding out. When you actually look at it you can't really see the horse. Fir enough that yes, the horse is a dark bay, but with the rider wearing dark clothes how can you expect a motorist to see you easily!? Country & rural lanes put horse riders more at risk of being involved in accidents on the roads by their very nature - narrow, low visibility with twists, turns & high hedgerows, as well as many allowing national speed limits. 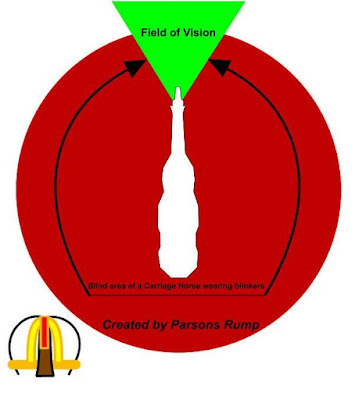 The main contributor is speed, especially when the roads are windy and sometimes only wide enough for one car's width. But also, when riders choose to hack out at certain times of the day when the light isn't great and suddenly, opting not wearing HiViz becomes a very high a risk factor. After attending a talk by The British Horse Society on the 31st May, it really opened my eyes. 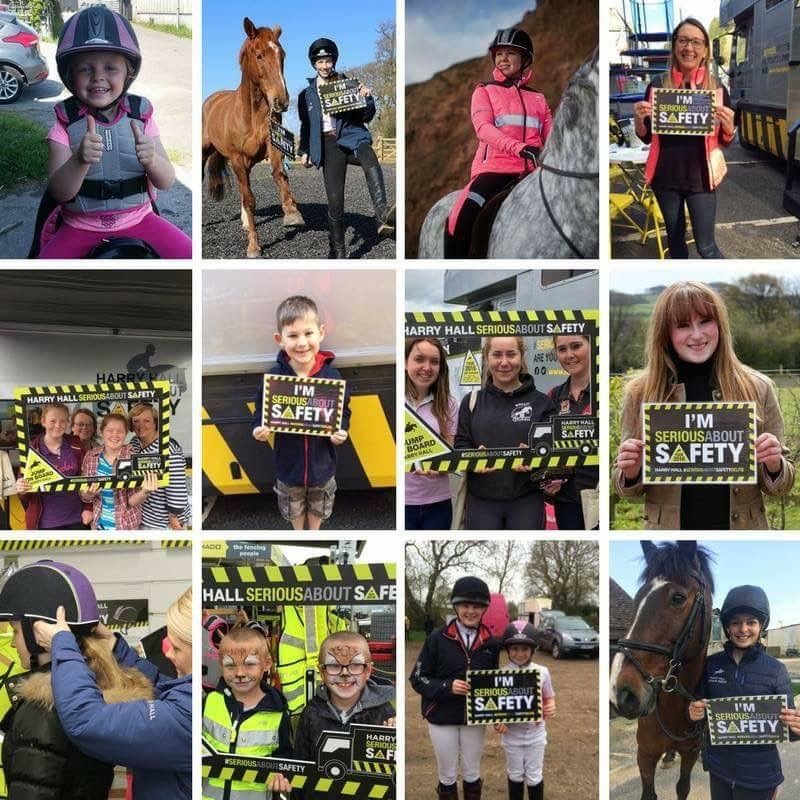 Their safety officer, Brian Hiscox, showed the statistics for the past six years of incidents involving motorists and equestrians on the roads. To be honest, it's quite frightening, and much higher numbers that I expected. Higher than you thought too? Well, if you did, here's something even more frightening - 80% of these incidents were caused by motorists going TOO FAST when approaching & overtaking horses OR travel TOO CLOSE as they pass!!! Will, who was pulling a funeral carriage, was killed on scene due to a negligent driver, who when overtaking Will, drove straight into him at speed. They pushed to make it Law that cars overtake horses at a MINIMUM distance of 1.5m and it appears that it was completely ignored. On having a discussion with the founder of the Facebook page, we will be trying to get section 215 of the Highway Code, which puts in place to protect us from harm by extending that overtaking safe-zone to 2m. There is a lot of hard work going on in the background but an exciting future ahead with the Glow Means Slow & Will's Law campaigns now joining forces. The powers of social media have been an amazing support. The awareness and support the campaign has raised has been beyond what I ever expected. I wanted the campaign to be noticed by not only equestrians & motorists but also the polices forces, the military, as well as transport companies who take riders to destinations for long ride outs. I waned them to not only be aware, but to really understand the message we were working to getting across. Glow Means Slow is very fortunate to have the support of DKS Transport. Through the inspiration of the campaign they now make sure they have HiViz wear available to their riders when they transport them to where ever that may be. RAF Valley have also shown great support of the campaign & after speaking to them about what Glow Means Slow is all about, they have shown interest in getting the team to one of their Horse Rider Awareness talks that they only hold twice a year which is very exciting, especially for us to listen to how they promote awareness. Sarah is also very pleased to tell us that the Glow Mean Slow campaign has teamed up with Harry Hall's Serious About Safety. When I approached them Glow Means Slow they were really interested. Harry Hall have been travelling to yards and focusing on HiViz and rider awareness when hacking out. 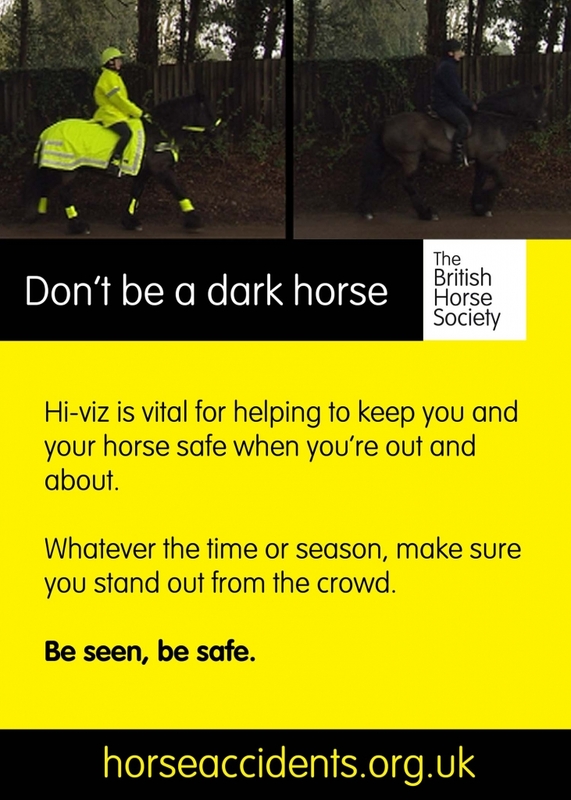 After a long discussion with the Harry Hall team they are now supporting us as we are supporting them, and due to my cob being the ambassador for the campaign once a month we trial HiViz products for them and provide feedback. 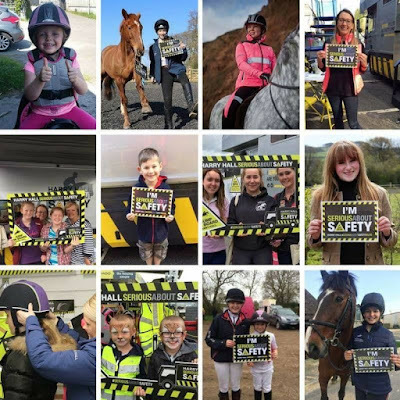 Moving forward Harry Hall and Glow Means Slow will continue to promote awareness and the importance of wearing HiViz when using the roads and rural lanes. What's next for Glow Means Slow? For the immediate future of the campaigns, we are looking into launching our own clothing range. This will enable equestrians ride out showing our motto - Glow Means Slow - across their waist coats. 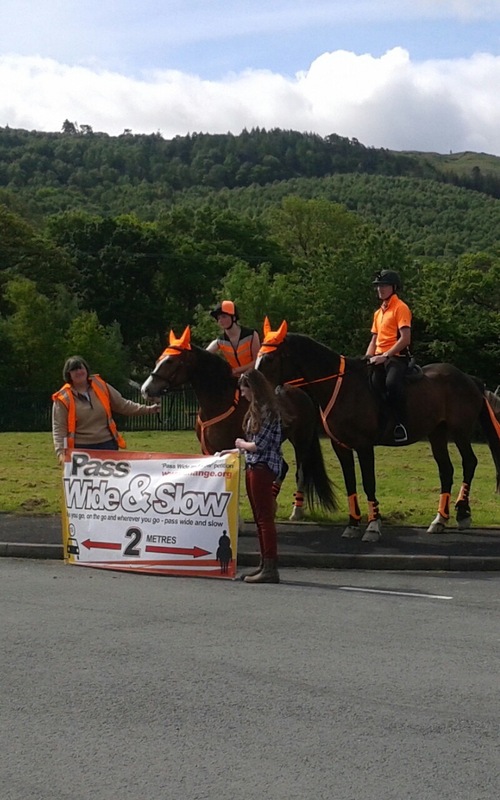 I'm very hopeful that this will raise awareness for motorists out there as they approach, pass and drive away from horses also using the roads. Of course, our hard work to continue to promote awareness will continue. Education is key when it comes to HiViz which is exactly what Glow Means Slow is all about. 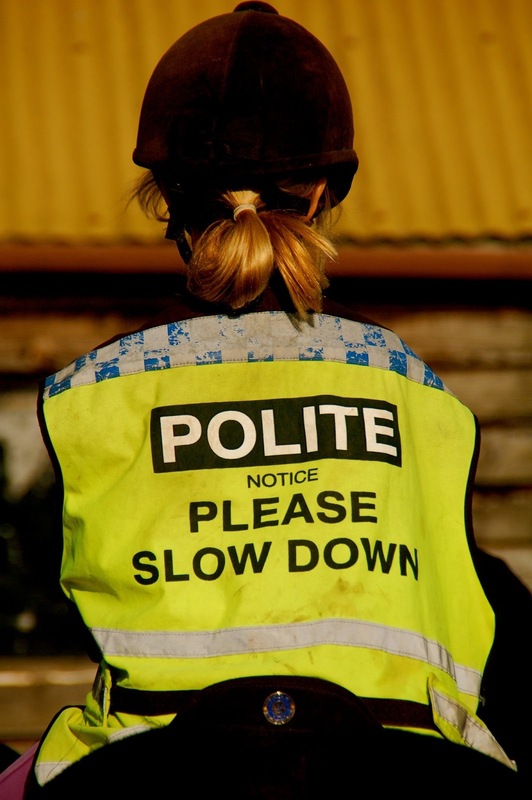 Many riders feel that because wearing HiViz isn't a mandatory law, they don't need to wear it. Many forget that, especially on rural lanes, HiViz could save their lives - those bright colours that make you stand out gives drivers more warning that you are there. The Highway Code advises that when using the roads and rural lanes bright clothing SHOULD be worn. Isn't that crazy!? 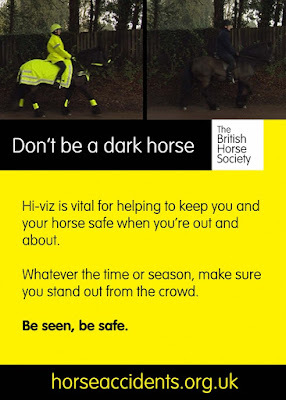 What is frightening is that there are some equestrians out there that believe car drivers should see us & so we shouldn't have to wear HiViz?! This is even more crazy & looks likes we have an education piece to do with riders as well as motorists!! What do you see first when your on a country lane - a horse or the rider?? 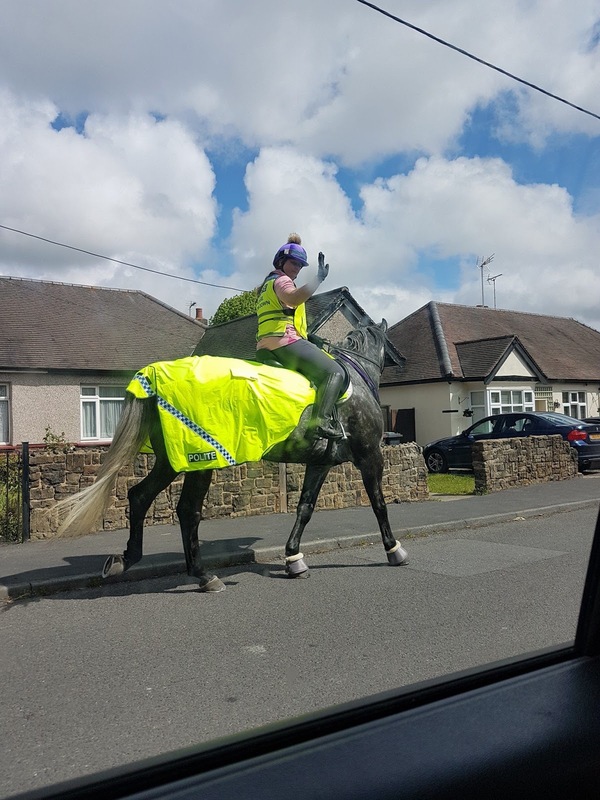 From those that I spoke to, the general consensus was that they see the rider as they're wearing HiViz, so what about the horse? Well, some drivers will see the horse first - just think of a blind bend. A horse is a big, heavy animal that can cause a lot of damage if involved in an accident. Why do many riders still feel that not even using a tail guard could potentially make them stand out to motorists? 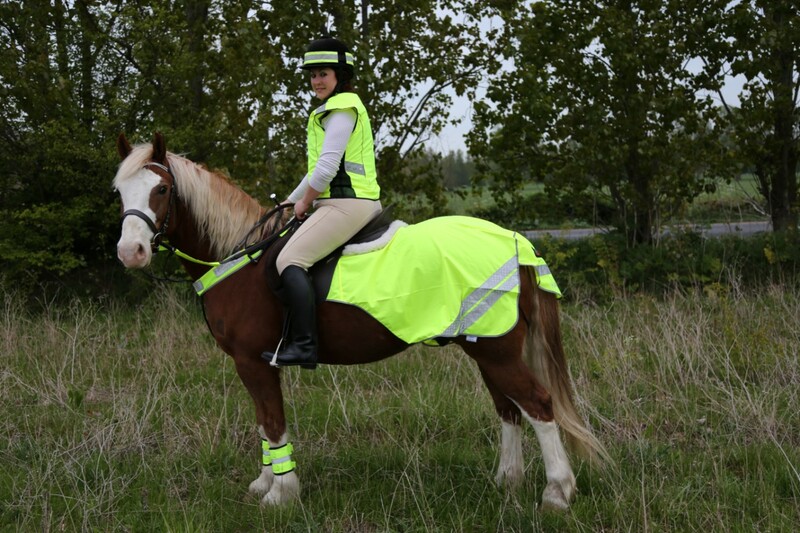 Can it really be that difficult to put HighViz on your tack for a casual ride out around the country. It is all education & sometimes it's the really simple things that can make a huge difference. Pass wide... AND slow, please. Finally, why do we ask motorists and other road users to pass wide and slow? Simply to prevent any form of stress or danger occurring. Horses are a natural flight animal and the slightest little thing can upset them. 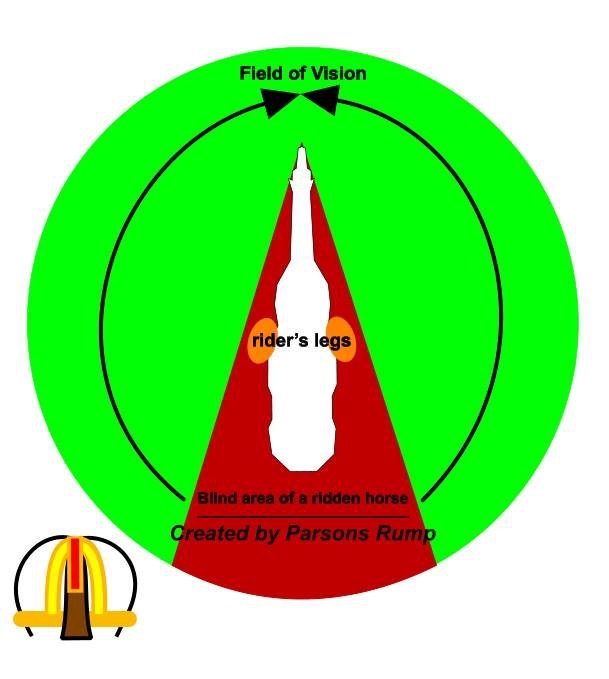 A vehicle approaching at speed from behind, not only can cause fear to the horse but also to the rider. The fear that the rider feels, you start to ask questions in your head - are they going to slow down? Will they see me? What am I going to do if my horse spooks? All of these questions the rider asks themselves as you approach, your horse has already thought about it & is starting to adjust his behaviour. Already your horses is doing "a risk assessment". Do I accept it and just continue? The frightening thing is even if a horse is classed as bombproof, this doesn't mean other external factors will not come into force - ever had a bird fly out the hedge at you? Made you jump! If something isn't right instantly they'll switch to follow their natural instinct of flight. A horse's natural line of sight when ridden is far better then what it is when they are driven, but across both. the horses rely on their riders or handlers to trust our judgement that the situation is safe for them. Before I sign off, I wanted to say that I am privileged to have a fantastic little team helping to promote campaign awareness, including three photographers which is just amazing. But the campaign wouldn't be where it is today with as much progress already made if it wasn't for the support we have received in such a short space of time. We are on Facebook, Twitter and Instagram - make sure you're following us for all our latest updates. What's the harm is adding some HighViz to help you been more visible when out & about. Three simple items - a bib, an elastic tail band and martingale or rein attachments. ...& remember, ALWAYS SAY THANK YOU to those who slow down and go wide! Support the Glow Means Slow campaign by helping to spread the word across social media! Pin this post! Oh wow, I don't think I've seen any riders here wear HiViz, including myself. While this area has a lot of horses, I am always shocked at how people will speed by! This is a problem with runners and cyclists too. You should definitely consider wearing some to help make you as visible to motorists as possible. In the BHS graphic, you can see how invisible you become, & that applies to poor light as well as passing through shade areas on a sunny day!! I would never go hacking on roads without HiViz on both my horse and I! It just seems silly to put yourself and your horse at such risk, which can easily be prevented by wearing HiViz! !